With the valuable assistance of skilled team of professionals, we are engaged in offering an extensive range of high-quality Decline Bench. - Ultra-thick DuraFirmTM upholstery provides maximum comfort. - 2"x 4" mainframe steel for exceptional Light Commercial quality. 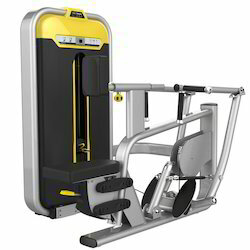 Unique styling, space efficient design, exceptional performance and versatility make Lat Machine a stand out anywhere. It's no-cable change design allows you to go immediately and directly to a long pull / Seated row exercise movement to further increase size, strength and endurance of your back muscles. to ensure user comfort, we feature over 2 inches of durafirm upholstery, double-stitched, fully supported and guaranteed to be tear resistant. high-density rubber foam grips and handles add comfort to the ergonomically correct gripping surfaces, while multiple seat and cushion adjustments provide unlimited positioning for any sized user. We hold expert domain in offering Commerical Equipments in different colours, such as silvery grey, silver and black. Our range of products are easy to handle with low power consumption and help to reduce weight. In addition to this, we make sure that these are timely delivered at the clients' premises. Backed by years of industry experience, we are engaged in offering a premium quality range of ABS Machine.